The application interacts with Hermes using web services, i.e., SOAP or REST APIs. The benefits of using web services are as follows. Firewall-friendly. The web services use HTTP as the transport protocol. 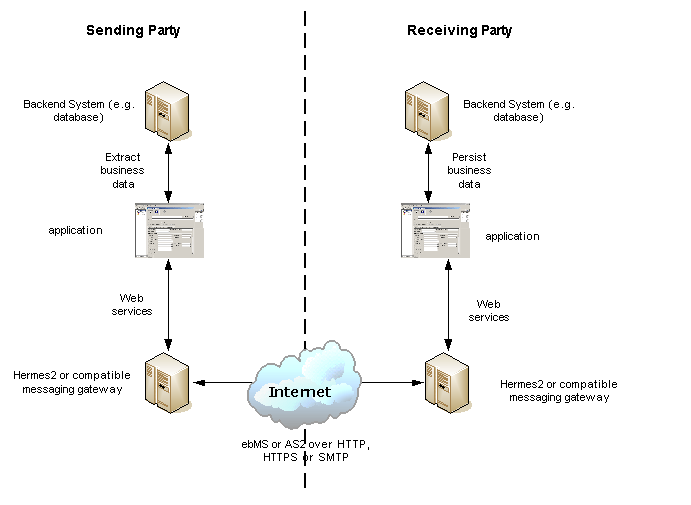 The application calls Hermes via web services over HTTP; in this way, persistent and stateful connectivity between Hermes and the application is not required. Even when there is a firewall between Hermes and the application, they can communicate with each other as long as HTTP port between them are not blocked. The source code shown below comes from the Hermes loopback test. The sample code assumes Hermes is using localhost with port 8080 (i.e., the default port of Tomcat). Create a SOAP message with the following 10 paremeters, and send it to Hermes as a web service request. Attach a payload to the SOAP message if necessary. Below example uses a purchase order XML as the payload, so the associated content type is application/xml. Hermes translates the SOAP request into an ebMS message and saves the ebMS message in its persistent storage. Then, the sender Hermes delivers the ebMS message to the receiver Hermes specified in the SOAP request parameters, of which cpaId, service and action identify the partnership between the sender and receiver. Create a SOAP message with the following 9 parameters, and send it to Hermes as a web service request. The method getFirstChild gets the first element with the name :code`messageIds` and namespace nsURI. It then extracts every messageId which represents an available message awaiting for a further action. Create a SOAP message with the identifier of the target message, and send it to Hermes as the web service request. The payload is extracted from the attachment part, and written to the input stream. In this way, the data can be piped to a processor or saved as a file. Create a SOAP message with the following 7 parameters, and send it to Hermes as a web service request. Create a SOAP message with the following 3 parameters, and send it to Hermes as a web service request. The sender Hermes translates the SOAP request into an AS2 message which is stored in the file system, and then delivers the AS2 message to the receiver Hermes specified in the SOAP request parameters, of which AS2From and AS2To identify the partnership between the sender and the receiver. Create a SOAP message with the identifier of the target message, and send it to Hermes as a web service request. Create a SOAP message with the following 5 parameters, and send it to Hermes as the web service request.